I present – the finished Flag Quilt. Perhaps a new all time favorite. Last week my friend Julie, from Norway, was here. I’ve already mentioned in a previous post that we met in England and lived in the same flat for 5 months. And became life-long friends. It always feels like no time has passed when we see each other again, even though it’s been a few years in between. We had a GREAT time just talking. 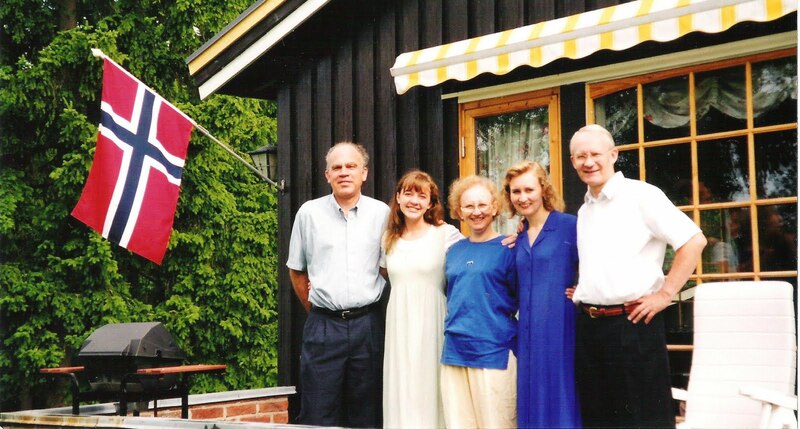 Thirteen years ago I visited her family in Norway with my parents. Let me just say, if you ever get the chance to visit Norway, run. It’s quite possibly one of the most beautiful places ever, in my humble opinion. Here we are last week in downtown Salt Lake City. And so I made her a quilt for the occasion. And since I’ve been on a bit of a flag kick, I decided to use her three favorite flags. (Julie was born in the US and lived here for part of her childhood, so she has dual citizenship.) Isn’t it great that their colors coordinate so nicely? Once again, I used Cath Kidston as my muse as well. And I am so happy to report that she loved it. Hooray! She’s always wanted a quilt. We both cried. Isn’t that the greatest feeling? Giving someone a quilt that they love? The back. All the fabric in this quilt came from the stash. Woo. I love the blue and white floral stuff – so Scandanavian looking to me. Reminded me of Julie’s mom’s kitchen. Well, all the fabric was from the stash except for one. The binding. I was having a hard time finding just the right thing, when I found this awesome red dot print for 50% off. Perfect! I didn’t wash the quilt because I figured it would be easier for her to transport back home nice and flat. I guess I’ll just have to find a way to get back to Norway sometime to see how the quilt looks washed. And here is a little bit more of those mountains. Happy holiday to those of you in the states! Oh, Amy, your quilt turned out fabulous! I bet it was hard to give this one away. <br />Isn&#39;t this a pattern you designed? If so, you need to publish for sure! <br />I have been to Oslo, and I agree, beautiful place. Our family roots are from Copenhagen. wow – it&#39;s perfect and such a great idea to use all 3 flags! Such a lovely story too.<br /><br />I took a quilt home from the US and carried in my carry on so I could sleep under it all the way home, instead of those horrible airline blankets! I love the quilt! Maybe I could make one of countries I have visited….hmmmmm….Canada, England, France, Switzerland, Italy…and of course the USA! Thanks for sharing! Fabulous! I love all the flags and they look so wonderful in all the Cath-inspired fabrics. The way you arranged them is so cool – not all just sitting there in a row. Love it! And that it will be so loved is the best! i&#39;m putting my hand over my heart right now!<br />I pledge allegiance to this quilt……<br /><br />FABulous!! Just a smashing quilt Amy! What a thoughtful gift for a long time friend. What an amazing quilt!! And how wonderful that she loved it…that is the best feeling in the world! Absolutely amazing quilt! What a special gift to a special friend. Ooh I love it! I was thinking of making a flag quilt to represent the countries I&#39;ve lived in and where I ended up. wow, wow, wow! this is lovely, I would have cried too! nice job! This is a stunning quilt, Amy! What a wonderful gift. The quilt is so wonderful! Your friend is a lucky gal. It makes me want to make a flag quilt… or at least a pillow. What a nice gift! It is gorgeous. I just love those flags and the overall look of it. Oh my gosh Amy, this quilt is absolutely stunning! You continue to amaze me! What a great quilt. I love our beautiful mountains. Love, love, love the flag quilt. Very creative and lovely quilt! It&#39;s wonderful to have such a great friend. Thanks for sharing! What a fantastic quilt! Loving it! Enjoyed the post … thanks for sharing! This is beautiful! I love it and it is pretty awesome how all three flags share the same colors. You did a great job! This is absolutely stunning, with a precious story! Great quilt and lovely story behing. Good to hear you still have contact after all this years. ok that quilt is amazing….if you made that up you need to make a pattern, its beautiful! http://www.crwflags.com/fotw/flags/sk.html<br /><br />I want to make your quilt with this flag in it. I LOVE it. oh how I love it. I could easily do it I think. And applique the shield. I&#39;m half danish and half slovakian. But everyone in Utah is danish or something scandanavia. Not many are slovak and I&#39;m proud of my non-lds heritage too. love it Amy ~ what a sweet wonderful gift for a friend of 13 years. This came out great! Nicely done.